A Great Oxendon "rustic yet luxury glamping business" has been named one of the most exceptional firms in the UK with praise for its impacts on sustainability. 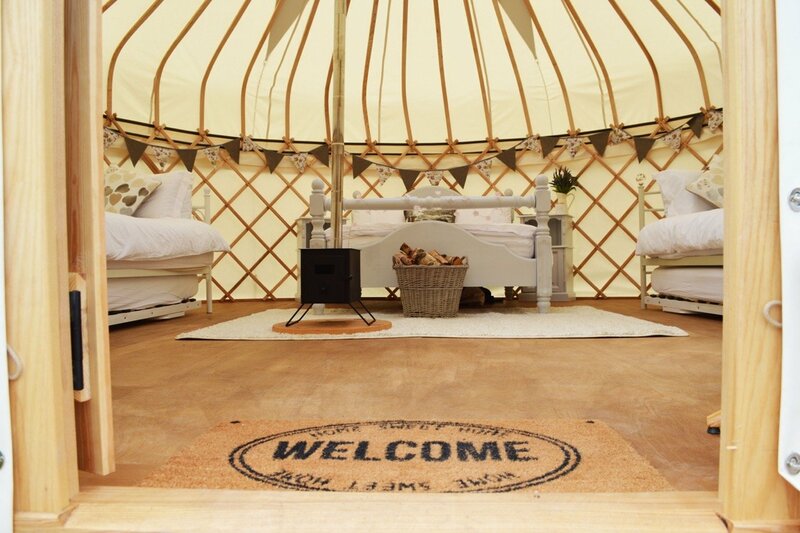 Country Bumpkin Yurts is based on a working farm in Northamptonshire. Set up by two childhood friends who share a mutual love of camping and the great outdoors, the eco-friendly glamping site has three yurts and a café. Jenny Lyon and Lara Collis noticed a demand for more Great British staycations – and connected their passions for the outdoors, the environment and ethical business with meeting this demand to create a business which is both economically and environmentally sustainable. The eco-friendly site has features including solar panels to power electricity in the yurts and composting toilets. Since launching in 2017 Country Bumpkin Yurts has already created six jobs. The business increased turnover by 200% from its first to second year. It also hosts charity events, regular craft sessions and yoga retreats in a community hub in its café. Country Bumpkin Yurts has now been named one of just 4 finalists across the UK for the “Sustainability” award in the Citi Microentrepreneurship Awards, funded by the Citi Foundation. "We are delighted to have been shortlisted in this category. It’s a huge encouragement to see other people share our heart for sustainability. Looking after the earth, and the people on it, is central to what we do and why we do it. From the low food miles for the Canvas Café ingredients, to the carbon neutral hot tub, we try to reduce our footprint and seek to inspire others to do the same." Country Bumpkin Yurts’ success story has been supported by "responsible finance” provider, Enterprise Loans East Midlands, who provided £45,000 of funding in order to help Jenny and Lara with the capital costs of setting up. "Sustainability is at the core of the Country Bumpkin Yurts offering so we are delighted they’ve been shortlisted for the Sustainability Award. The eco-friendly site has features such as solar panels - which power electricity in the yurts - a log burner, a wood fired hot tub, and composting toilets so we think they’re a perfect fit for this award." Remarkably one other Enterprise Loans East Midlands client, Hypermotive of Lutterworth, Leicestershire is a finalist in a different category of the Awards – and ELEM itself, one of around 50 “responsible finance” providers in the UK, is a finalist in a special award to celebrate the resilience of the ethical finance industry. “We are delighted to be a finalist for the Resilience Award as we pride ourselves on supporting businesses from every community and background. We consistently seek out SMEs and entrepreneurs who need an extra boost to take their business to the next step so this nomination means a lot." The number of microenterprises continues to grow in Britain, with the UK’s 1.11m micro-businesses employing over 4m people – 17.6 per cent of the workforce. A third of microenterprises access external sources of finance, and "the advice, mentoring, business support and skills development that responsible finance providers offer to their client businesses and social enterprises is just as important as the finance they provide," according to Jennifer Tankard, Chief Executive of Responsible Finance. "The Citi Microentrepreneurship Awards are a celebration of the enterprises and local businesses – like Country Bumpkin Yurts – that are the backbone of our communities. Year upon year, we see the increasing value of microenterprises in the UK, from businesses that have created jobs for marginalised youth, to businesses providing low-cost services for charities, or developing innovative and sustainable food sources," said Bob Annibale, Global Director, Citi Inclusive Finance and Community Development. He added, “This year's Citi Microentrepreneurship Awards align with the UN Sustainable Development Goals agenda and the shortlisted businesses and responsible finance providers all contribute to economic growth and the social and environmental vibrancy of their communities." Country Bumpkin Yurts and Enterprise Loans East Midlands must now wait until 13 March 2019 when the winners of the Citi Microentrepreneurship Awards will be announced at an Awards Ceremony in Liverpool.